Description: "home of Pauls, Inman, Kansas" is the identification on the back of the photo. It was used in Mennonite Life, July 1953, p. 133, with the caption "First Bethel Mennonite Church building. (now private residence) taken in pioneer days with some members of church. 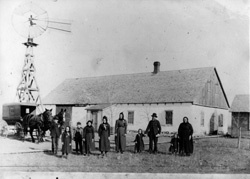 "; used in Mennonite Life, Sept. 1994, front cover, "Family of Heinrich Neufeld and Agneta Kroeker and their children in front of the Bethel adobe church building, newly adapted as residence. This is the earliest known photograph of the building, taken ca. 1910, by an unknown photographer."